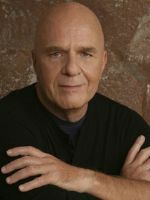 Dr Wayne W. Dyer is an internationally renowned author and speaker in the field of self-development. He's the author of more than 30 books, including Inspiration, The Power of Intention and Change Your Thoughts, Change Your Life. Wayne holds a doctorate in educational counselling from Wayne State University and was an associate professor at St John's University in New York, USA.